Prior to about 1835, there were no houses on Lordship Road (or Lordship Lane, as it was called until the 1830s) north of "Meadow Street" (present-day Lordship Terrace). In the 1830's, new local land development policies meant that it became possible for a few reasonably well-heeled families to have houses built in the area that felt like rural retreats, yet were accessible (by horse and carriage) to central London. 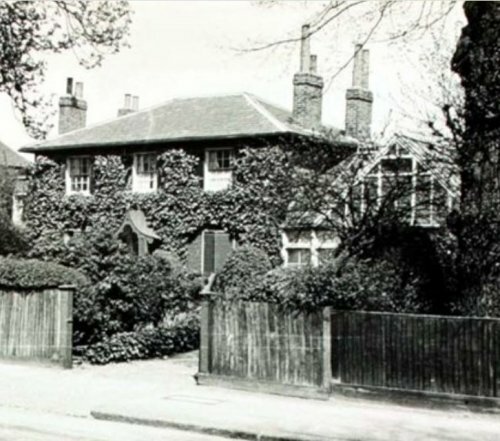 Between about 1835 and 1870 a dozen-or-so such houses were built on the west side of Lordship Road. With the arrival of mass transit - trams and overground trains - to the area in the 1870s, demand suddenly grew for the building of huge numbers of less-grand (though still very impressive), terraced houses - and the era of Stoke Newington's grand detatched rural villas was drawing to a close. St Mary's Lodge is the only one of the grand early Victorian villas remaining. Though it is in a very sorry state indeed, it is hoped that the house's owners and Hackney Council will do whatever it takes to ensure that this last link to an important part of Stoke Newington/Hackney/London history is not lost forever. Linton Lodge was the southern half of the lone pair of semi-detached houses that first appear on Crutchley's 1828 map of Stoke Newington, making them the first of Lordship Road's "Grand Villas". Early residents include a solicitor, George Adams Farr (offices at 1 Princes St Spitalfields), and his family. Mr Farr's career saw him serving as Clerk (administrating solicitor) of the Governors of the Whitechapel Union, and as Vestry Clerk of Spitalfields, and as Clerk to the Commisioners of Paving for Mile End New-Town. Years later, Linton Lodge would be the final home of Mr John Runtz until his death in 1891. Runtz was one of the main forces behind the campaign to establish Clissold Park, and was the father of Stoke Newington's first ever mayor, in 1900, Sir John Johnson Runtz. 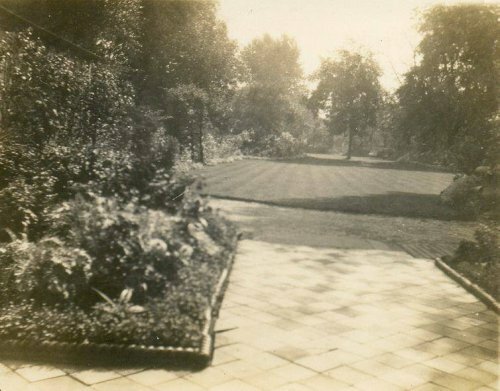 Along with Willow Lodge (the other half of the semi), the gardens of the two houses extended almost all the way back to Queen Elizabeth's Walk. The houses and gardens together occupied the land that today is the site of the Avigdor Mews residential development and nursery school. 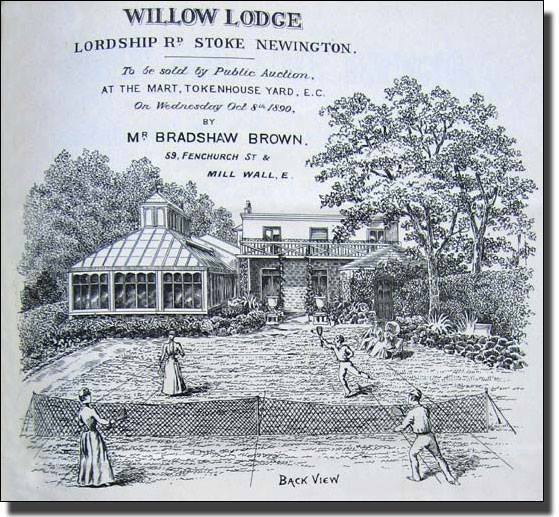 Willow Lodge featured extensive gardens and outbuildings, with a live-in gardener. Willow Lodge's 1851 owner was a 42 year-old "Linen Draper" (cloth merchant) called Thomas Gibbs. His company, "Thos. D. Gibbs & Jas. Linen Drapers" had shops at 13 & 14 Plumber's Row in Whitechapel and also on the City Road. 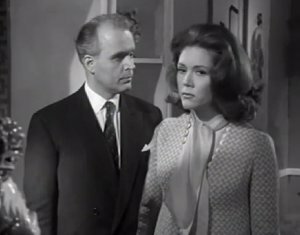 Gibbs was unmarried, but shared the house with his widowed mother Emma, a 27 year-old cousin Ann, two young nephews and one young neice. Newlyn's first residents, in 1871, were "stock and share dealer" William Bartlett, his wife Mary, and their 7 children. 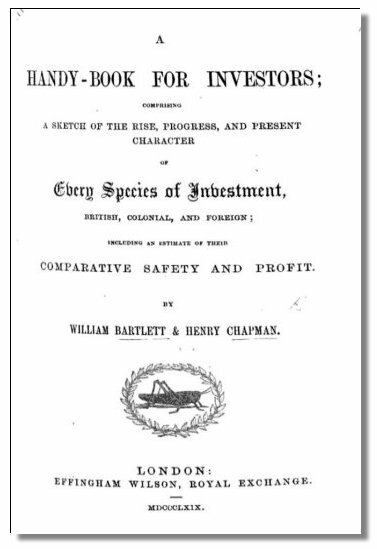 In addition to his own share dealing, Bartlett co-wrote a very comprehensive "Investing for Dummies"-type book. The 1901 census shows Newlyn being occupied by William Tilley, his wife Emily, their four children and three servants. Tilley's occupation is given as "gas fitter/engineer", but this is a bit of an understatement, to say the least. 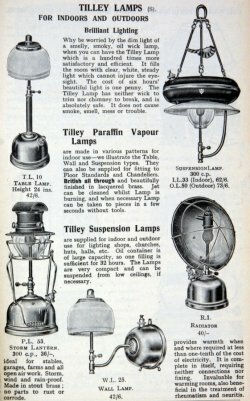 In fact, he was heir to the WH Tilley (gas engineering & appliance design) Company - the originators of the well-known Tilley Lamp - with premises at 53 Kingsland Rd. Many of the Tilley clan are buried in Abney Park. The 1911 Census shows Newlyn inhabited by Edward Holton Coumbe (31 January 1865 - 10 September 1942) with his wife Ada and daughter Nancy. 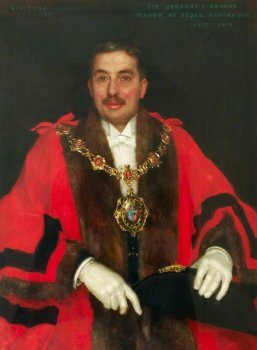 Reputed to have had a number of mistresses and to have fathered numerous illegitimate children, Coumbe was a barrister and prominent north London politician who served as Stoke Newington Mayor in 1921-22. A short bio of this rather controversial character can be seen HERE. Roslyn's first occupants, moving in some time in the early 1870s, were a 42-year-old upholsterer called Charles Fox, his wife Annie, their 5 children and 3 domestic servants. 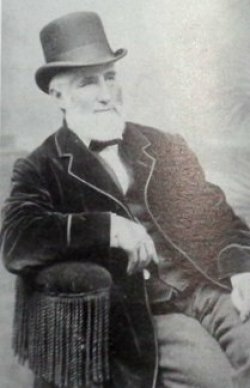 Charles Fox was a partner, with his father, in the family's successful furniture-making and upholstery businesses - "Thomas Fox & Co Upholsterers and Decorators" and "Thomas Fox & Co Cabinet Makers" - in central London at Bishopsgate Street, Peahen Court, Whitehart Court and Wormwood Street. 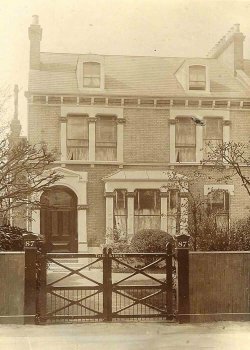 The Foxes were still on Lordship Road in 1881, but towards the end of the decade they moved to a house in Beckenham which, interestingly, they also called "Roslin" (though spelt with an "i" instead of a "y" this time). 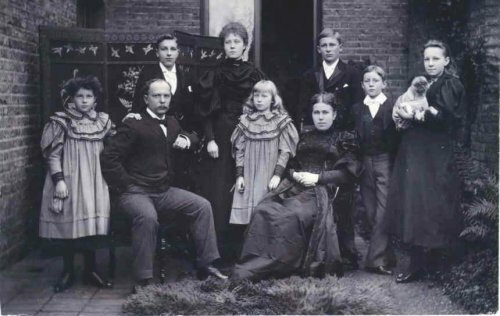 Around 1899 the Yates family - John and Eliza and their seven children - moved to Roslyn House after many years living nearby at 84 Bethune Rd. After only 5 years in the villa, Mr Yates, a stockbroker's agent, died in 1904. 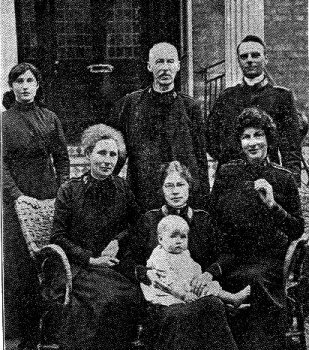 Soon thereafter, Eliza and some of the younger children moved back to Bethune Rd, this time to number 124. From 1905 until 1933 Harry and Louisa Jones and their family of four girls and two boys lived in Roslyn. Mr Jones was a Hackney-born architect. 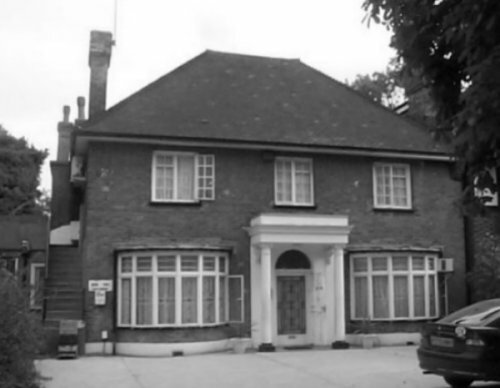 Louisa "Louie" Jones had been raised just up the road at The Limes, 87 Lordship Road. 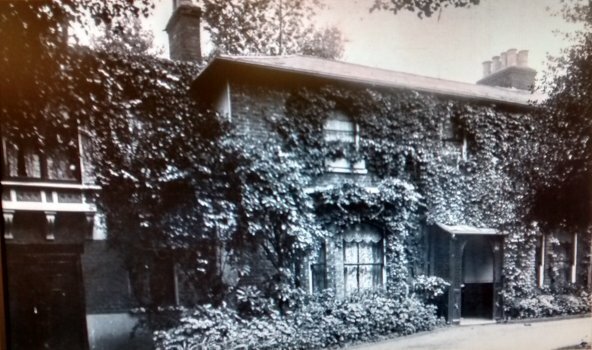 Built in 1843, St Mary's Lodge was one of the first "country villas" built on Lordship Road - arguably the richest in historical and architectural merit - and is the last of its era still standing. It was designed and built by its first owner, the influential Victorian architect & surveyor John Young. In the 1930s, the house was the boyhood home of the respected character actor Richard Bebb. 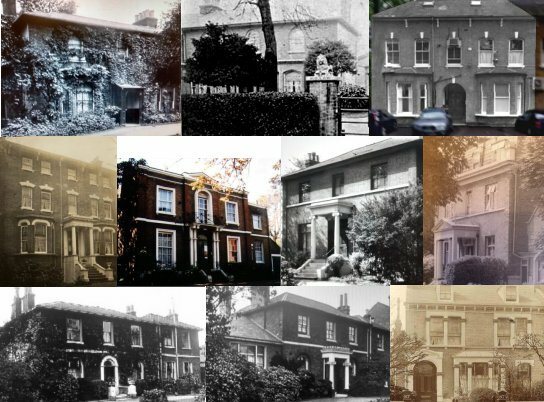 A history of all of St Mary's Lodge's inhabitants over the years can be found HERE. Ely Lodge appears to have been built for its first owner, Mrs Jane Alice (Smith) Sargant, who was born and raised in the "The Isle of Ely" area of Cambridgeshire in the 1790s. 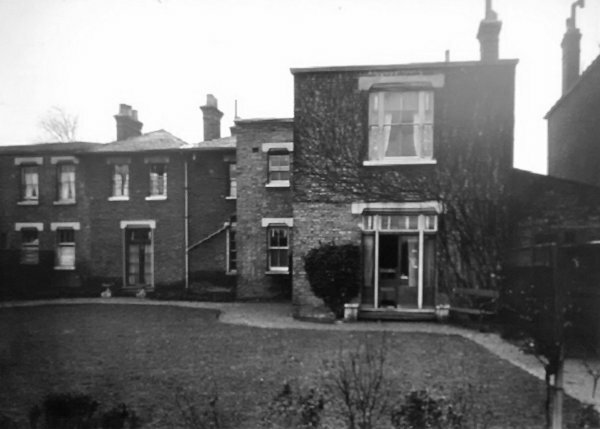 By the time Ely Lodge was built in the 1840's, "Mrs Sargant" (her husband had deserted her when she was still in her 20s, but she continued to use the name) was a well-established literary figure. 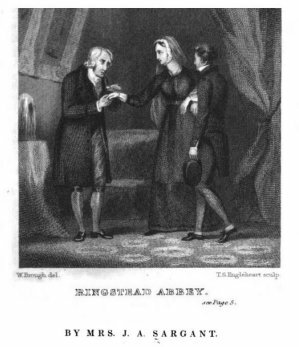 Her first published work, 1817's "Sonnets and Other Poems", established her as an important female poet of the early 1800s Romantic-Era Revival; she subsequently expanded her work to include novels, biographies, travelogues, political commentary, and children's fiction for educational use. (See Amazon's listing of her available work HERE.) 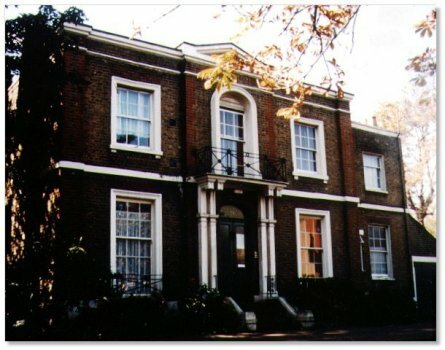 Prior to moving to Ely House Mrs Sargant lived, and ran a school, at 6 Clapton Square. 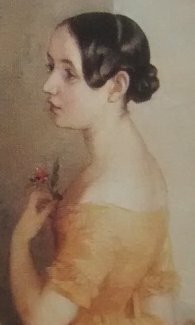 After Jane Alice Sargant died in 1869, Anna Maria inherited the house and continued to live in it until her own death in 1875. Eleanor, Jane and Anna were all buried at St John's, Hackney. Next, the house was occupied by mercantile clerk Mr Adam Gardner, his wife Isabella and their 9 children. By 1891 they had moved locally to Amhurst Road. 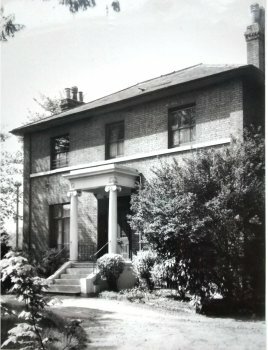 After the Gardners moved on, the villa is known to have been home to Robert Dallas, a retired partner of the city-based James Duncan & Co umbrella manufacturing company. He died at Ely Lodge in 1903 at the age of 93 and is buried, with his wife Charlotte, in Abney Park Cemetery. 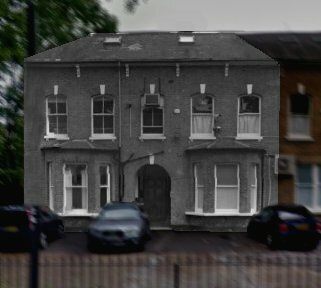 In the 1920's 75 Lordship Road was the last home of Salvation Army bigwig Frederick Booth-Tucker (son-in-law of S.A. founder William Booth). The Booth-Tuckers called the house "Simla", after the city in India in which they had spent many years doing missionary work. Frederick was noted for having assimilated into Indian culture much more than his colleagues typically did, and for adopting the name "Fakir Singh". Booth-Tucker is buried in Abney Park. 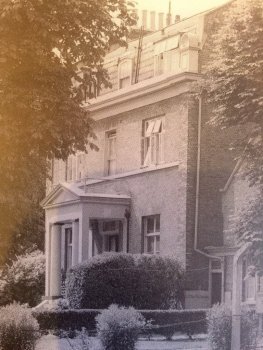 75 Lordship Road's final occupants, in the 1960's, were the family of physician Dr Archibald Sherwood, who also ran his medical surgery from the house. Ely House was demolished in the mid 1960's for the building of the present-day Brookgate flats. This "River House" is not to be confused with the large manor of the same name that existed up near Seven Sisters Rd/Woodberry Down. Its first residents were 64 year-old widowed builder & plasterer John Bowcher and his family of 7 grown-up children. 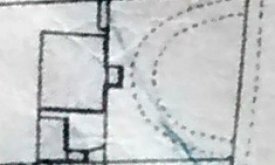 As a builder (with business premises at 30 Bush Lane near Cannon St and 8 Somerset St, Aldgate), it is suspected that he had the house built for himself, but this is not known for sure. 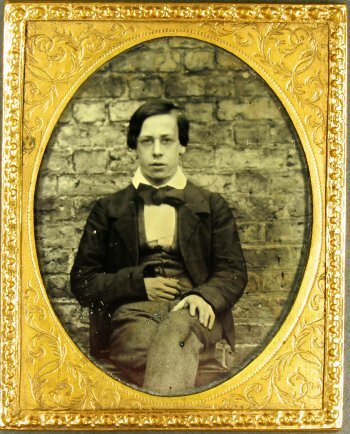 Mr Bowcher died in 1856, but all but one of his children would continue to live in the house until the 1890s. 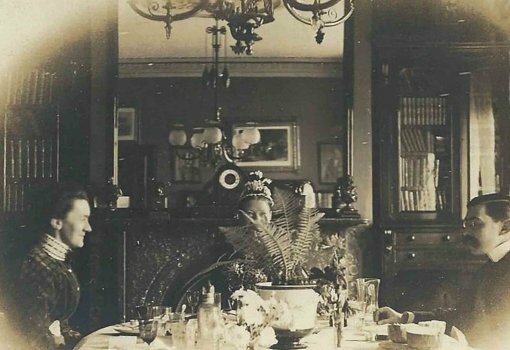 During the Edwardian era its residents - architect Henry Wood, his wife Amy and their son, Henry, who would be killed in WWI - called their home "The Chestnuts". 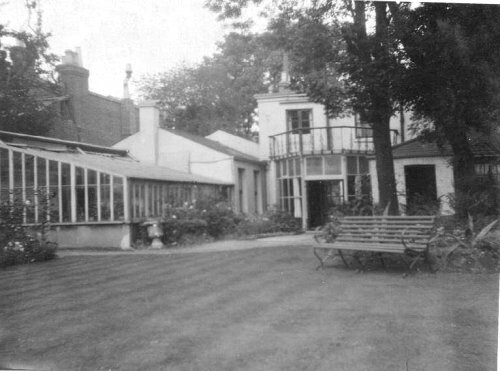 The villa was ultimately used to house the nursing sisters working at the Bearsted Hospital. River House, as well as the hospital itself, were demolished in the late 1980's for the construction of the present-day Schonfeld Square housing development. No photos of this villa have been located yet. Marlborough House's first owners appear to have been 24 year-old Aikaterini "Katherine" Ionides Lascaridi - the youngest child of the hugely wealthy Greek merchant Constantine Ionides - and her husband George Peter Lascaridi, a well-connected young Greek businessman. In the 1851 census Katherine is listed as the Head of the household, (perhaps her husband was just away on business on Census night), and her mother Mary was staying at the house, possibly to help with Katherine's new baby. Constantine Ionides and his family were great patrons of the arts, and particularly big fans of the renowned Victorian painter George Frederic Watts. 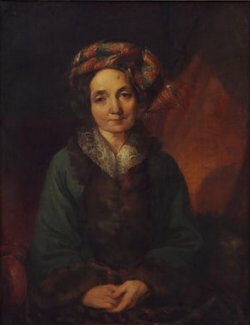 During the course of the 1800s Watts would paint portraits of 5 generations of the Ionides family; many of these portraits are today in the V&A museum's collection. Sadly, things did not go well for Katherine and George after they moved from Lordship Road to Craven Hill in Kensington in the late 1850's. George got into financial trouble and faced bankruptcy proceedings in 1861, and in 1862 Katherine died at the age of just 36. Among Marlborough House's later occupants were 54 year-old William Wells, his brother Henry, 25 year-old daughter Mary Ann and 17 year-old son William F Wells. Wells was a corn & coal merchant, with business premises at White Lion wharf, 18 Upper Thames Street, & New Corn Exchange, Mark Lane, & 228 Shoreditch High Street. By 1881 William F had taken over the business and was, with his unmarried sister Mary Ann were still living in the house. By 1891, William was retired and had a wife, Catherine. 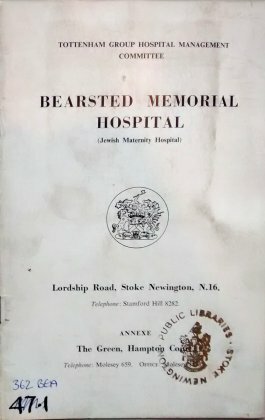 Marlborough House was demolished in the late 1940s and the grounds were aquired for the building of the Bearsted Jewish Maternity Hospital. No photos of this villa have been located yet, either. According to the 1871 census, Southampton House's first residents seem to have been a mister "M. Allen", widower, and his four children. All had been born in Holland. 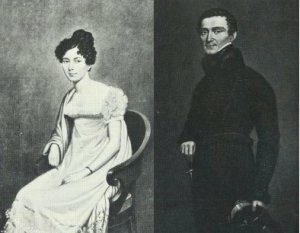 The house's next occupants were John Markham Dean (1815-1903) and his wife Charlotte Millyard Dean (1815-1881). Born in High Wycombe, Buckinghamshire, Dean was a very successful landowner, merchant, property developer and shipowner in the Falkland Islands colony. Dean's business activities are credited with having brought considerable benefit to Falkland Islanders. 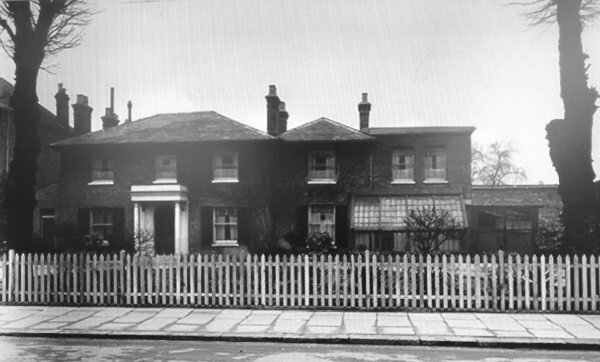 The Deans appear to have lived in the Falklands for much of John M's working life, but from the mid 1860s they were based in Stoke Newington - firstly in Stoke Lodge, just on the other side of Lordship Road from Southampton House. 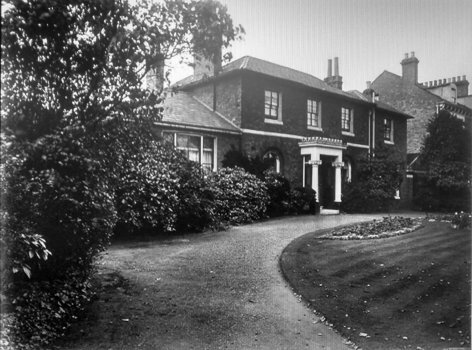 The Deans moved to Southampton "Lodge", as they called it, in 1874. By 1881, John Markham Dean had turned control of the businesses over to his sons and was living full-time at Southampton House with his wife Charlotte, who would die that year. Dean continued to live at the house until his own death in 1903. 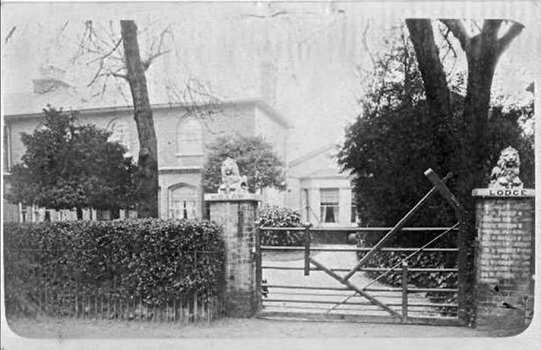 Southampton House, too, was demolished in the late 1940s and the grounds were aquired for the building of the Bearsted Jewish Maternity Hospital. Springfield Lodge's first occupants, in the 1841 census, were a Mr Christopher Higgins and his family. By 1851 "retired corn dealer" John Funston Burgess had moved in with his wife Hannah, daughters Maria and Priscilla, and the family's domestic servant Mary Gilbert. Burgess's business had been on Lime St, central London. In 1871 Springfield was home to a "grocer's master" called Henry Headley, his wife Hannah and their 10 children. In 1881 Springfield Lodge was occupied by Corn & Flour Merchant Frederick Hicks (businesses at 156 Hoxton Street & 15 Old Street), his wife Letitia and their 10 children: Algernon, Jane, Henry, Frank, Charlotte, Eustace, Lilian, Hugh, Earnest and Annie. By 1891 a Bank Manager by the name of George Henry Alexander and his wife Harriet were living in the villa. 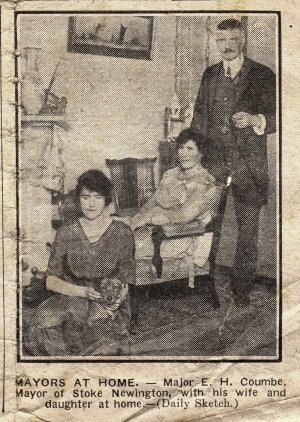 Mr and Mrs Alexander continued to live in the house at least until 1911. 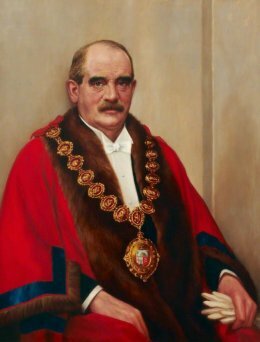 From the 1920's until his death in 1935 Springfield Lodge was the home of Stoke Newington's influential Alderman and Mayor (1913-19 and 1929-34) Sir Herbert J Ormond. Ormond and his father owned draper's shops at 147/149 and 161 Stoke Newington High Street. Sir Herbert is buried with his parents in Abney Park. 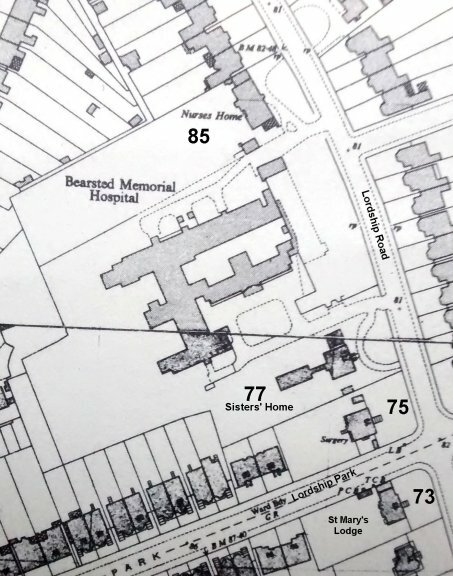 The Lodge was subsequently demolished and the grounds were aquired for the Bearsted Hospital development. With Bedford House's first occupant (Bank of England official Mr Edward Eld) showing up on the Electoral Roll at this address from 1834 (Lordship Road still being called Lordship "Lane" at this point), Bedford House was one of the earliest-built of Lordship Road's grand villas. Eld would continue to live in the house until his death in 1880. Henry Dunkley, a saddler (and apparently no relation to the noted local stonemason of the same name), and his family moved into Bedford House by the time of the 1881 census. They appear to have renamed their home "Dart House". Henry Dunkley & Son is listed as being a "saddlers' ironmongers, saddlers, harness & whip manufacturers", with business premises at 67, 69 & 71 Clifton street, and at 4 & 5 Merrett's buildings, Worship street London EC. From the late 1940s, this villa served as the residence of the Bearsted Hospital's nursing staff. 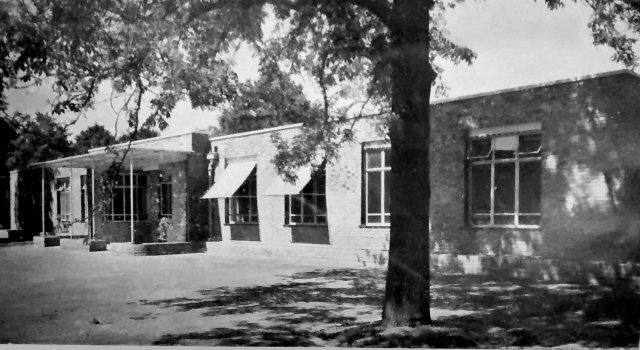 The house was demolished in the 1980's when the entire hospital complex was demolished and the Schonfeld Square housing development was built. 85 Lordship Road is now the site of the "Norwood Wellbeing at Bearsted" health clinic. The end unit of a terrace of mid-sized villas, from the time it was built until the 1910s this house was the home of Thomas and Elizabeth Read, and their daughters Elizabeth and Louisa. 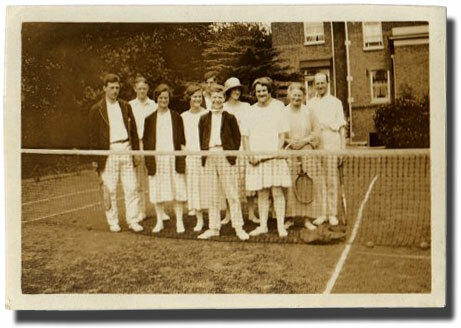 Louisa Read grew up to become the Mrs "Louie" Jones who lived at Roslyn, 71 Lordship Road, from c1900-1930. and son-in-law Dyson Edward Mee in The Limes around 1900. 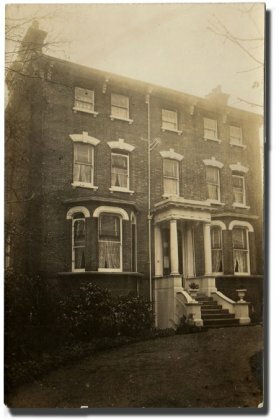 On the east side of Lordship Road, opposite to where the terrace including The Limes was eventually built, stood two large detached homes, Lordship Lodge and Stoke Lodge. These houses appear on a map from 1838, putting them among the earliest-built of Lordship Road's grand villas. Lordship Lodge's first occupant was a prominent Stoke Newington surgeon, John Durrant Harcourt (b.1776) and his wife Harriet. 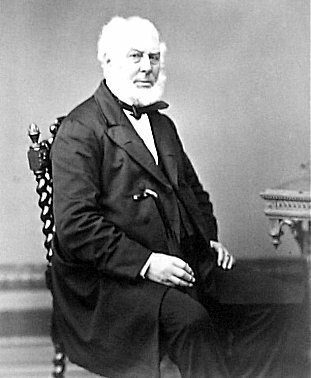 John Harcourt died in 1842. In 1851 the house's owner was a young stockbroker by the name of Thomas Waller. Next came Francis Volckman, a wholesale confectioners with business premises at 144-146 Stoke Newington High Street. Volckman and his family would live in the house until the 1870s, when Henry Bannister Barr (of Turner & Barr, wholesale cabinet makers, upholsterers & general house furnishers, 6 & 7 Tabernacle Row central London) bought the house. Lordship Lodge was demolished in the 1930s/40s for the construction of a pair of semi-detatched houses currently divided into 4 flats. 2016 - Only the northern half of the original house survives today, and this remaining part has itself been extensively altered over the years (most notably the roof has been raised and bay windows have replaced the originals flanking the front entrance). 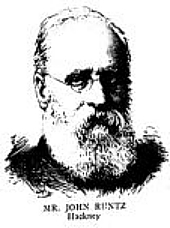 Stoke Lodge's first occupier was a Mr Francis Herman b.1792, about whom not much is known. 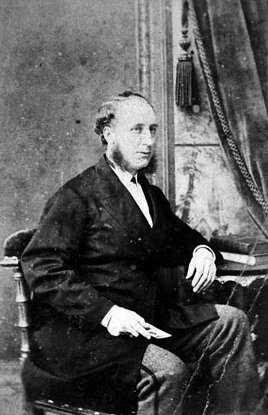 In 1851 the occupant was James P Marsh. In 1871, John Markham Dean, who was eventually to move across the street to Southampton House, was living here in Stoke Lodge. 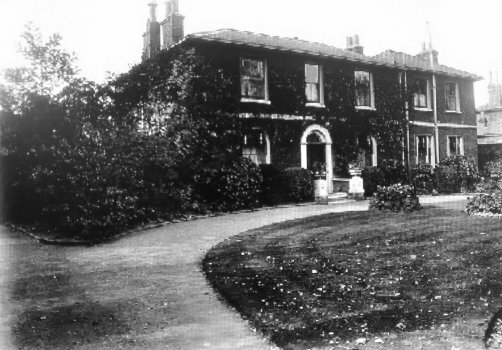 From 1875, the house was owned by Edward Ransome Allen, who ran Stafford Allen & Sons, the prominent drug manufacturing company that had been established by his father, Stafford Allen. The Allen clan, starting with Edward's grandfather William Allen, were prominent Stoke Newington Quakers who had been active in the campaign for the abolition of the slave trade. William, Stafford and Edward were buried in the Friends (Quakers) burial ground on nearby Yoakley Road. In the 1920s Stoke Lodge was the home of another Stoke Newington Mayor, Alderman Francis Augustus ("F. A.") Dod (b.1863, d.1931). Dod was an "auctioneer and furniture ware-houseman", with business premises situated at at 59-63 Stoke Newington High Street.